Cressland is a charming 5 Star Gold 15th-century Grade II* cottage overlooking the famous `Splash' in the picturesque village of Kersey. The Suffolk brick floors, exposed floorboards and fireplaces are all original and parts of the house date back to the 1400s. Cressland has been sympathetically and beautifully restored, offering guests the spirit and feel of its ancient origins, combined with everything you need for modern comfortable living. The perfect characterful retreat. Large spacious rooms, 4 bedrooms, 3 bathrooms, living room with open fire, dining area with large dining table (perfect for family parties) and fully equipped country kitchen, with dining area and comfortable settle, as well as a beautiful cottage garden, with summer house, and barbecue. Please see our website for further information www.cresslandbythesplash.co.uk. Kersey is one of Suffolk's most photographed ancient villages starring in Films, TV and adverts. Each bedroom is named after TV programmes, advertisements and films which have been shot in and around Kersey. Lovejoy: The first scene of the first series of Lovejoy was filmed right outside Cressland in the ‘Splash’. Meerkat: A ‘Compare the Meerkat’ advert was filmed in 2011 in the Village Street, pub and school. Hallows: Harry Potter and the Deathly Hallows features scenes filmed in Lavenham. Witchfinder General: The opening scene of this cult 1960s film is set in Kersey. Cressland is the perfect place to experience the peace and tranquility of the Suffolk countryside, a friendly welcome in the local pub, country walks straight from your door and many cycle routes. The village is within easy reach of the Suffolk coast, Lavenham, Clare, Constable country, Woodbridge, Aldeburgh and Southwold. Cambridge is 60 minutes away and London 90 minutes. My husband and I moved to Suffolk 8 years ago with our 3 children. We didn't really know Suffolk at all and had no friends or family in the area, so the move from London to a small country village was very daunting. It didn't take us long however to settle into village life and make friends. Kersey may be small, but it has a great friendly community with so much happening throughout the year. I look after the cottage and our 3 children and my husband works in London and helps out with doing the gardening and maintenance. We have all fallen in love with Suffolk and continue to enjoy exploring this wonderful county. Cressland has all the old-world charm of a 15th century cottage, but with all the modern day amenities with spacious rooms, easily accommodating large groups, or two families. It is also perfect for romantic weekends. We wanted guests to have the flexibility of self-catering, but with the added feel of a luxury hotel experience. Located right next to 'The Splash' in the picturesque village of Kersey, and 100 m from the local pub, it is the perfect, idyllic rural retreat. Suffolk, as one of the driest, warmest and sunniest counties in England, is the perfect holiday destination. There is also so much to do and see in the area. Walking, cycling, sailing, visiting the many picturesque medieval villages, market towns and Constable country. Exploring heaths, forests, heritage coastline, beaches, castles, historic houses, as well as fun family days out and activities. We are even close enough to visit London and Cambridge for the day. Kersey is one of the most picturesque villages in Suffolk, consisting of many listed properties and appearing on many postcards, calendars, TV programmes. It also has a fantastic ford (referred to by locals as The Splash) crossing the High Street and Cressland has the enviable position of being located right next to The Splash, with amazing views from all the bedroom windows up to the beautiful village church (floodlit in the evening for special occasions and at weekends). Very spacious with 2 large sofas and chairs, ottoman, coffee table, desk and bureau, TV/DVD with selection of DVDs. Beamed with original brick floor, rug, original fireplace, and open fire. A large dining table with 8 chairs. The dining room has a log burning stove. Toys for girls and boys. Notes on accommodation: Office with wi-fi, family games, puzzles and books Outside: Private garden directly next to stream with patio area, outdoor dining area, barbecue, summer house. The cottage has its own drive which offers parking for 2 cars. Cleaning / Towels / Linen / Maid service: Luxury bed linen, towels provided, including a hairdryer in every bedroom. Other: Dining Room : Large oak dining table and chairs to seat 8 people, large inglenook fire place with log burning stove, and full barrel of logs provided. Side table with light and ipod/ipad,iphone docking station, radio and CD player. This house is amazing! Centrally located to so many wonderful sights north of London. Louise, the owner, was wonderful! We had a great welcome basket waiting for us after our long trip. This is a stunning old timber-framed cottage which has been beautifully and tastefully decorated to create a gorgeous holiday home. The furnishings (curtains, upholstery) are lovely and complement the characterful old building. Excellent bedding and thoughtful extra touches including dressing gowns and slippers for every guest, and a generous welcome hamper. The village of Kersey is picture postcard perfect with amazing old properties, the 'splash', and a lovely old pub. It is surrounded by rolling countryside with lots of walks, and not too far from Hadleigh and Lavenham for more history, beauty and facilities. An amazing place to catch up with friends, recharge batteries and enjoy the countryside. The property is delightfully presented and the hosts were very welcoming ( the welcome package was much appreciated and very generous). Thank you so much for taking the time to write a review. I am really pleased you enjoyed your stay. After a long day travelling we were delighted to arrive at Cressland, a wonderful house in a beautiful village. The welcome basket was the ideal way to revive the troops. It was filled with lots of local produce and goodies. There was lots of room for the whole family. The children were delighted with the selection of toys available for them to play with. All these little extras made our stay very special. I would highly recommend this house for any family looking for a quiet get away. Thank you Bridin for your lovely comments and I am so pleased you enjoyed staying at the cottage. We loved Cressland and also the village of Kersey. The house was awesome with so much character. For us a perfect retreat from the crowded and tourist filled London. Close to many other great small villages and we also spent a couple days at small Sea towns. Cressland exceeded all our expectations as did the village. Louise was great to work with and the welcome basket was just simply the best. I would highly recommend the Cressland and if we gat a chance to get back to the UK it would be my first choice of places to stay. Thank you for a great time! Cresslands is a beautiful home, with everything being top quality . Kersey is such a very pretty village. It makes such an impact on the visitor. Cresslands is the perfect place to stay. There is no shortage of equipment, the beds are very comfy, with excellent sheets. The welcome basket is very good. Having walks right on the doorstep is a bonus. Hadleigh with its good shops is very near. I would thoroughly recommend staying in Cresslands. We even heard the cuckoo early one morning! Thank you so much for your lovely comments. I am really pleased you enjoyed staying at the cottage and exploring the local area on your walks. I do like the sound of a cuckoo! 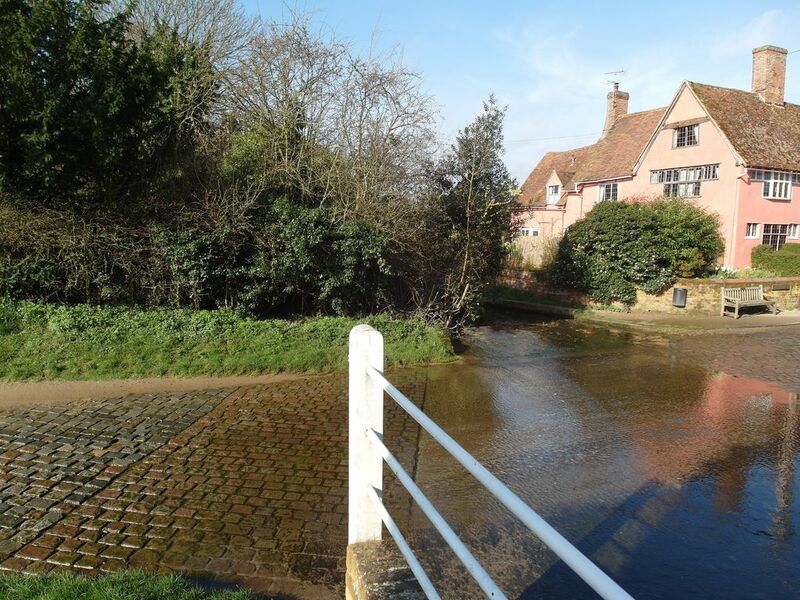 Kersey and the surrounding area offers beautiful open countryside for cyclists and walkers to explore, as well as picturesque, unspoilt villages, a host of attractions and interesting places to visit. The Suffolk Coast is also within 30 minutes’ drive. Aldeburgh 38 miles (1 hour by car) Blue Flag shingle beach, beautiful, famous seaside town. From Hadleigh A1141 signposted Lavenham. After 1 mile turn left signposted Kersey. Turn right past the Church and down the hill. Go through the ford “Splash” and house is just on the left. Hadleigh market town 2 miles from Kersey. Supermarkets, butchers, chemist, bakers, banks, Post Office, restaurants. Hollow Trees Farm shop in Semer 5 mins drive away. Dating back to medieval times, Kersey is a picturesque, traditional Suffolk village, consisting of many listed properties. Kersey became prosperous and famous for its “Kersey Cloth” during a period centred on the 14th and 15th centuries when the broadcloth industry provided wealth to South Suffolk communities. There was a steady decline in the 17th century when the village experienced a period of poverty. The village now has a thriving community, with many societies and events taking place throughout the year. In many ways Kersey is a hidden gem, but once found it is never forgotten and it appears on many postcards, calendars, TV programmes and even a jigsaw puzzle. Visited by painters, walkers, cyclists and tourists. Over the years countless scenes have been shot here for films, TV programmes and advertisements. The first scene of “Lovejoy” is through the famous “Splash”. Kersey was also the scene for a recent Meerkat advertisement and home to the author Sir Hammond Innes who lived at “Ayres End”. St Mary’s Church at the top of the South end of the village is visible for miles around, especially when floodlit. Every Thursday evening between 8-9 pm you will hear the bell ringers practising. The 14th Century Bell Inn, 100yds up the road has oak beams, a cosy open fire and offers good traditional pub food and local ales. Kersey Mill, located just off the main road before the Kersey Village sign, is a Grade II* listed mill house and watermill, together with a Grade II listed converted maltings. It stands in grounds of around 16 acres on the banks of the River Brett near Hadleigh, and has been converted into a gym, hair salon, beauty rooms, art gallery, and tea room. Booking Notes: Available for long/short breaks and romantic weekends Short breaks : minimum of 2 night stay. Monday to Friday (get 4 nights for the price of 3). We do have a discounted rate for 4 people or less. Please call or email me to enquire - tel: 01473 822815, email: info@cresslandbythesplash.co.uk Stay more than 2 nights and you receive a larger discount on the cost per night. Please call me on tel: 01473 822815, or email me on www.info@cressslandbythesplash.co.uk for a quote, as the price displayed on the system is not the price you will pay. We do accept online payments see terms and also payment by bank transfer or cheque. one third of total rental cost as deposit to confirm booking, balance payable 8 weeks before start of holdiay. Security deposit of £150 payable with balance and returned at the end of the holiday provided there are no damages. Changeover Day: Ideally Friday or Monday changeover but can be flexible. Notes on prices: There is a discounted rate for 4 people (using just 2 bedrooms) We also offer a 2 night "Weekend escape to the Country" special late arrival (up to 12 am meet and greet) for those who work late on Friday evening, with late Sunday 4 pm departure. Rental cost includes: All bedlinen, towels (including beach towels), welcome basket, basket of logs.